I wrote the first version of “Salaam Alaikum” in September 2001. The story won an award for non-fiction at the 2010 Surrey International Writers Conference contest and helped to increase support for Women for Women Afghanistan (see www.cw4wafghan.ca .) I’m posting “Salaam” here today to pay tribute to special people and experiences from the past and welcome the new year with promises to share some new travel stories soon. I can still smell the streets of Kabul. I breathe in the tang of dung smouldering under charred cook pots and the stench of fresh wet mud applied to new buildings as I sit here at my desk trying to make sense of the experience. Beside me is a small blue suitcase covered in dust. Inside, maps that mark the route we took are faded and crisp. Rubber bands, around stacks of pamphlets and the letters I wrote my mother, are disintegrating. I pull out one of the tourist brochures and read, “Afghanistan is a land of sunshine with an extremely healthy climate… its famous and historic sites and its amazing local colour provide fascination and thrilling experience for every traveller.” It was an exaggeration, propaganda perhaps, but mostly true. 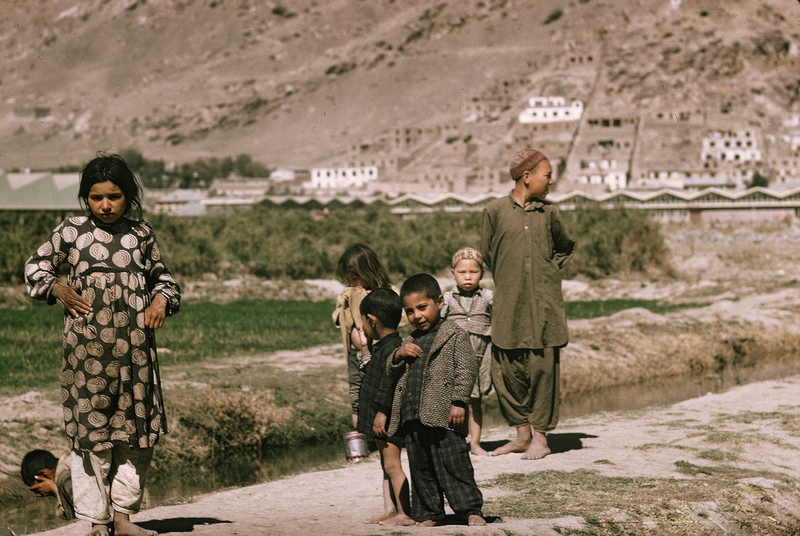 The Afghanistan we knew then was beautiful and thrilling to discover. People were full of hope, believing that they were on the cusp of a healthy future. 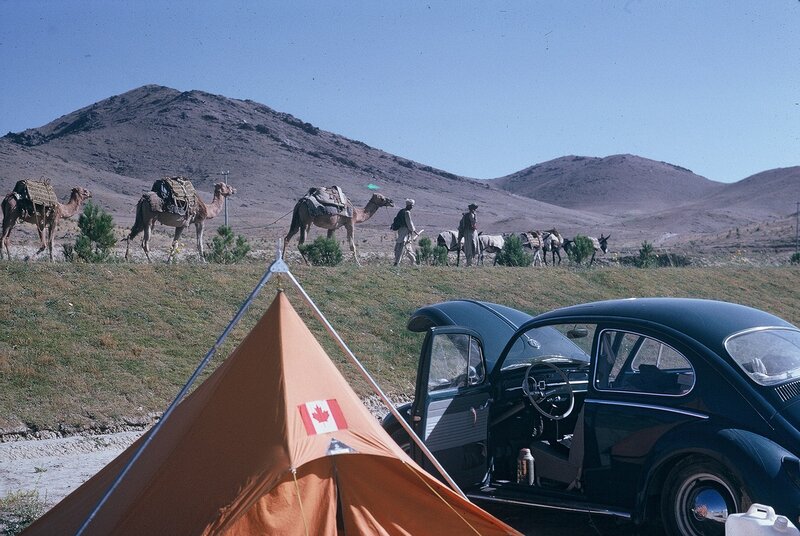 In 1965 it was a good place for us to stay while India and Pakistan sorted out their border dispute and reopened the frontier so my husband and I could continue our travels along the Silk Road. Everything I see around me is brown. Gravel streets are lined with murky ditches and adobe houses hide behind mud walls. Children are covered in dirt, pus seeping from their infected kohl rimmed eyes, noses streaming with thick mucus. Brown – a colour that is inconsistently dark. I even feel brown with worries and fears rolling around inside my head. We live and work in a new suburb of Kabul near the university. In spite of the gloom I feel, our street is filled with cheerful activity and slowly it is drawing me into a new life. There are people are everywhere. Gangs of children run between packs of dogs, goats and chickens that graze through the garbage. Older youth walk by on their way to the campus. Most of the young women carrying armloads of heavy textbooks are dressed like I am, in modest skirts and short-sleeved blouses. Other women are covered, their mysterious blue and mauve burkas silently swirling around as they stroll along. Men wear long shirts and baggy trousers and some wear turbans. They walk hand in hand, drive in little vans, and ride bicycles. Everyone is carrying something, doing something, going somewhere. Afghanistan is a busy place. Protected from the chaos and excitement of the street by a wall, our house has a small courtyard inside with stairs at one end leading to a flat roof. I love the roof. From here I immerse myself in the lives of our Afghan neighbours. I look down into their courtyards and watch meals being prepared, children being disciplined, and grandparents being cared for. Today a threadbare rug in the centre of the yard was rolled up, taken away, and replaced with a massive, traditional red and black Afghan carpet. In a hive of activity a feast is spread out and, from my perch, I watch an uncharacteristically sombre group of people gather. It is a funeral. My neighbours are celebrating the life of a loved grandparent who passed away early today. Minding the younger children are two older girls, about ten. The tiny face veil sewed into their new blue burkas constantly slips out of place. Undaunted by being blinded, tripping and falling, the girls deftly yank the fronts of their troublesome burkas back over their heads to their shoulders so they can see and continue playing, Batman style. I’m in awe of their bright confident demeanours and resourcefulness. 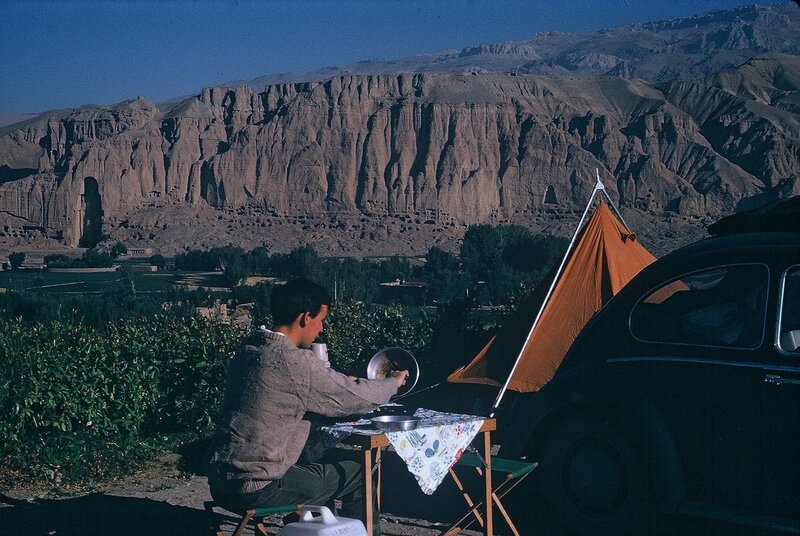 We take a break for a few days and drive up into the Hindu Kush Mountains, toward Bamiyan. Once a thriving centre for Buddhist art and culture, it is famous for its 1500 year old standing Buddahs, the largest in the world. While we’re in the area we’ll visit Band-e-Amir, a group of deep azure lakes hidden at 3000 metres elevation in the desolate central range. Driving north from Kabul on a sleek new Russian-built highway through the Salang Pass we turn west after a couple of hours. New asphalt morphs into wretched track. The flat tire is inevitable. We tell ourselves we’re lucky it’s only one so far and pull into a field to repair it. Two small girls in colourful rag dresses come to watch, crouching down onto their haunches. Their eyes shine with curiosity and smiling politely they clasp their hands to their chests and bow their heads. “Salaam alaikum,” peace to you, they say. “Salaam alaikum,” I reply, and our friendship begins. Eventually their parents join us and stand by ready to help. “Milmastia,” hospitality, I am learning, is the sacred duty of tribesmen toward guests in their rugged and unforgiving terrain. With the tire fixed and our hearts warmed we drive on through the mountains and eventually a lush, green valley framed by snow-capped Hindu Kush Mountains comes into view. By the river a gravel road, neatly lined with poplar trees, directs us through orchards laden with nuts and fruit, to a cluster of family compounds. This is Bamiyan. We set up camp on a hill overlooking giant sandstone Buddahs and ancient monasteries carved into cliffs across the valley. A group of elegant looking men, dressed in multi-coloured, wool cloaks and furry karakul hats, comes over to say hello and asks us to join them for tea at their table nearby. Together we watch the sun setting, casting its warm glow on the marvels of history we’re all here to see. Traveling back to Kabul, the new road is jammed. Trucks grind along ahead of us, brightly painted with scenes of the magnificent mountains, fields, and lakes we visited. Piled on top are sacks of grain and dozens of tribesmen embraced by bandoliers, bullets and massive rifles. They are celebrating Jeshin holy days. Laughing and waving they aim their rifles at us. They’re playing, urging us to join them in the fun. We laugh, although somewhat tentatively, and return their waves. We’re all celebrating the holiday. We stop at Kabul market, crammed with merchants, shoppers, and onlookers crowding into little kiosks and stores. I can buy anything I want here. Today we need to pay for a present we bought for ourselves last week. We missed a digit in the confusing math that transformed our Canadian dollars to Afghanis. The carpet would cost ten times more than we calculated. This time we hand him a great wad of Afghanis and he stashes it in his pocket, without counting. We shake hands and move on. Later we’re surprised to meet our carpet shopkeeper in another store. He takes the wad of Afghanis we gave him from his pocket and buys a transistor radio. I understand then that the world is becoming more accessible and soon the Afghanistan we know will change. Snow is falling softly outside my window as I write and a thick cloud settles on Grotto Mountain. I want to remember Afghanistan the way it was, full of hope. The haunting image in today’s paper is a ghostlike figure, a woman wandering through an Afghanistan I do not know – houses in rubble, streets dominated by violence – a joyless place. “Families Find Homes Wherever They Can” reads the headline. The fields are laced with landmines; there are no fruit or nut trees. The rivers are mere trickles. 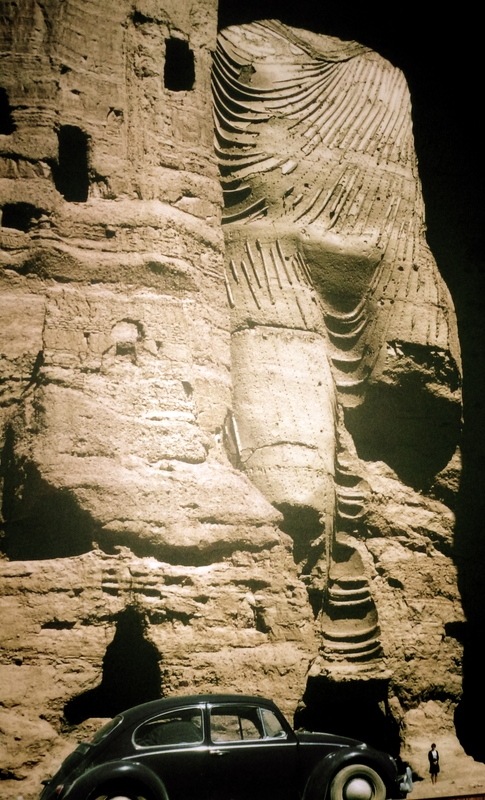 The giant Buddahs in Bamiyan were blown up. Then the terrorists attacked again. In New York and Washington. I don’t know why my mother kept the stacks of letters I sent. Did she know I would need them someday, to help me remember how beautiful it was? I can’t throw out our old Afghan rug that’s worn to shreds. Repeated patterns in it connect with one another, although each unit has its own special characteristic. It reminds me of people. Although we’re all different we have common qualities that connect us. The little girls who watched us change the flat tire are in my thoughts a lot these days. They should be grown women now and I’d like to talk with them again. Are they still making friends with strangers and saying peace to you? Their curious eyes and lively smiles in the black and white photo hanging in our living room keep me hoping that someday our story about Afghanistan will have a happier ending. What are your thoughts? Peace to you. This entry was posted in Silk Road. I so enjoyed your memories of Kabul, the descriptions were so vivid, I could almost smell the dust in the streets. Wouldn’t it be wonderful if we live long enough to see Peace in that troubled land, and in all of the Middle East. Thank you for your thoughtful comment Audrey. With the hopes and good work of people like you, change happens and the world is better. Best wishes for a healthy and happy 2012. I’ve read this story and heard this story a few times and must say with each reading I see / feel a little more. It’s wonderful to see those photos — they are so sweet and peaceful. Thank you Sarah. Lets hope for a better future for children, especially girls, in Afghanistan. Wonderful account of people and the commonalities of people of dfferent ethnicities and customs, from a kinder gentler time. Thanks Mette. It will take a lot of hope, commitment and hard work to help make life better in Afghanistan. But I think it can be done. See the Canadian Women for Women in Afghanistan for news, updates…and inspiration.